Nissan’s roomy midsize Pathfinder receives numerous improvements. 2017 Nissan Pathfinder Platinum 4×4. 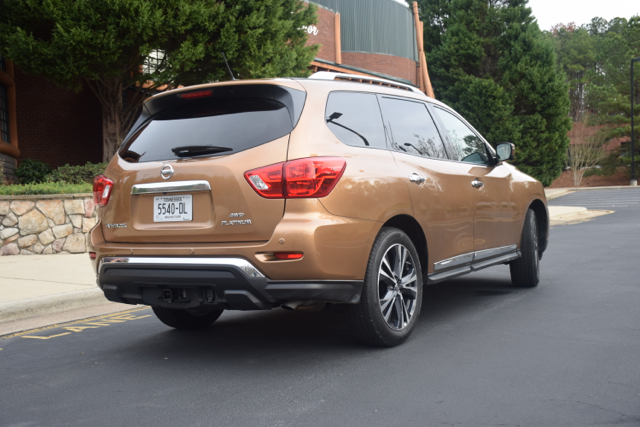 The 2017 Nissan Pathfinder has been refreshed, the first significant change since the current-generation model debuted in 2013. More forceful styling, enhanced safety and technology features, and an updated engine are among the changes evident in this three-row, midsize crossover SUV offering room for seven. The Pathfinder updates are both well-timed and significant as consumers continue to shift their purchase decisions away from cars to SUVs and trucks. Indeed, the shift has been so significant that the compact Rogue SUV is now Nissan’s best-selling model, displacing the midsize Altima sedan. 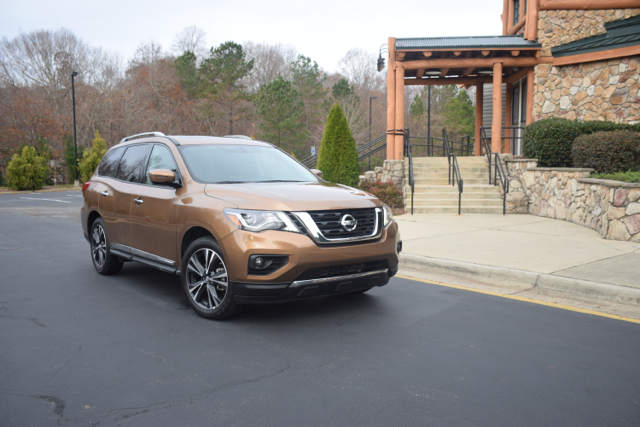 As for the Pathfinder, the changes help Nissan remain relevant in a segment where the Ford Explorer, Toyota Highlander, Dodge Durango, Honda Pilot, Chevrolet Traverse, Kia Sorento, Mazda CX-9, Buick Enclave, Hyundai Santa Fe, and the GMC Acadia vie for customers. Yes, customers have so many choices — manufacturers, including Nissan, must keep these vehicles fresh or risk losing customers. The 2017 Pathfinder is available in S ($30,290), SV ($32,980), SL ($36,100), and Platinum ($42,070) grades or trims. Add $940 for destination. Upgrade to a 4×4 and you’ll pay $1,690 more. 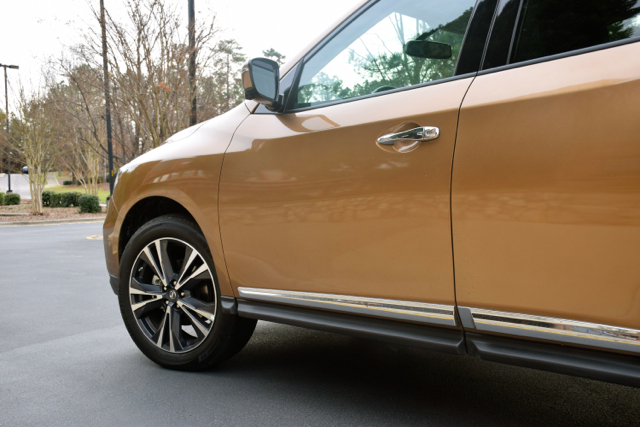 Nissan fans, particularly Pathfinder followers, will immediately take note of the many changes made to the 2017 model. It starts with a striking front fascia marked by LED boomerang headlights along with LED daytime running lights. The grille now reflects Nissan’s recognizable V-motion design. Other changes in the frontal presentation include a new hood and front bumper, giving this model a stronger expression and a wider stance. Changes to the rear fascia include updated tail lights and bumper design, offering more detail and a sharper look. Also new are front chin and rear roof spoilers, rear tire deflectors, and suspension fairing. Body-colored bumpers along with integrated side mirror turn signals are also present. Two new exterior color choices are added, bringing the total choices to nine. 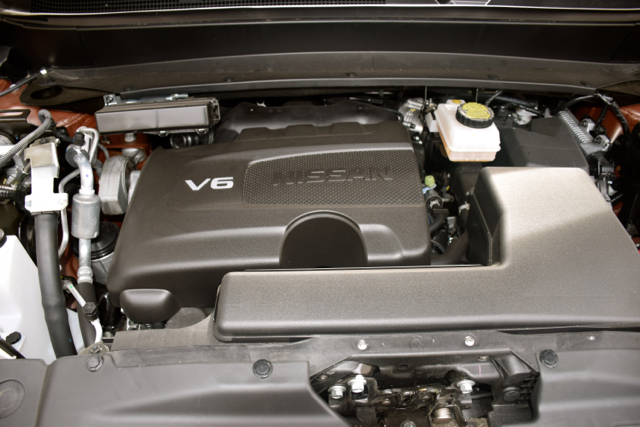 Under the hood, the 3.5-liter V6 was reworked with a direct injection gasoline system added, increasing horsepower from 260 to 284 and torque from 240 to 259 pound-feet. The continuously variable automatic transmission was also updated with in-house D-Step Logic Control incorporated, what simulates shift points and enables more natural RPM progression. A similar arrangement is found in the Nissan Maxima flagship sedan. Despite the increased power, fuel economy is unchanged with the front-wheel drive model delivering 20 mpg in the city and 27 mpg on the highway. Similarly, the 4×4 makes 19/26 mpg city/highway, same as before. Notably, the 2017 Pathfinder benefits from a 20-percent increase in towing capacity. When properly equipped, this model now tows up to 6,000 pounds. For 2017, Nissan rolls out several available driver-assist features, including an around view monitor with moving object detection, blind spot warning, rear cross traffic alert, and forward emergency braking. The updates are supplemented by an advanced drive-assist display offering additional infotainment and driver assistance information on the screen. As for tech features, an 8-inch color touch-screen monitor is standard across the model line. The NissanConnect Navigation system now includes three years of SiriusXM Traffic service and available NissanConnect Services for six months. This feature is included on the Platinum level. Other changes for 2017 include an updated suspension for improved driving dynamics and stiffer front and rear springs as well as rebound springs added to the front struts. These changes make for improved roll, pitch, and bounce motion control versus the 2016 model. Most press fleet models distributed are top-end grade versions — my test Pathfinder Platinum was no exception. Where lower-grade models are trimmed with cloth seats, this one comes with leather-appointed seats with climate-controlled front seats. Moreover, you’ll find wood-tone interior trim, a power tilt and telescoping steering column, and a 13-speaker Bose premium audio system. But there is no need to fret that desirable amenities are reserved for the top-trim models only. 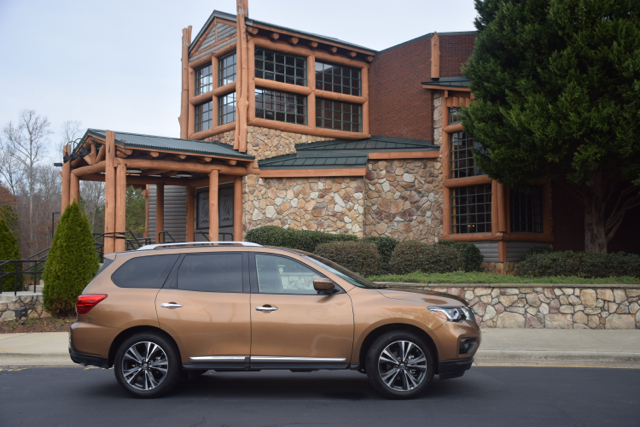 Indeed, if you consider the Pathfinder S, you’ll still have push-button ignition, a rearview monitor, Sirius TravelLink, a latch and glide seating system, three-zone climate control, and cargo under floor storage. Other grades bring in remote engine start, power front seats, a leather-wrapped steering wheel and shift knob, heated rear seats, and a heated steering wheel. Also available is metallic interior trim, stainless steel front kick plates, and a 120-volt AC power outlet. 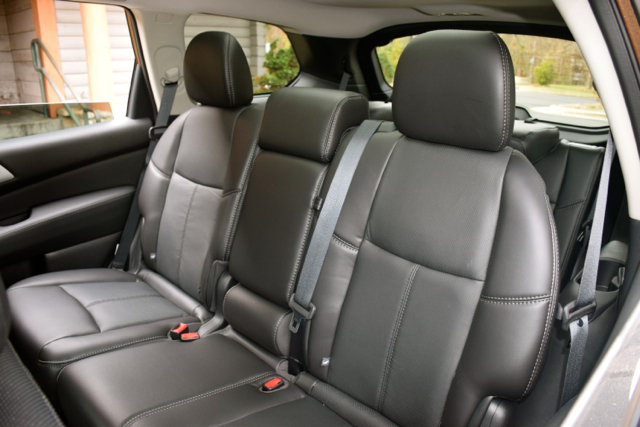 As for seating, the Pathfinder is available in a single 2-3-2 configuration. Behind the front bucket seats is a 40-20-40 split-folding bench seat with a 50-50 fold-down bench seat in the third row. Access to that third row is accomplished by means of an “EZ FLEX Seating System” featuring the previously mentioned latch and glide system. Here, the second-row seat slides about five inches forward and tilts for ease of access to the third row. Families will like this because even with a child seat in the second row, it doesn’t have to be removed before tilting. Further, the third-row seats recline, making what normally is a less desirable seating area palpable, at least for youngsters. 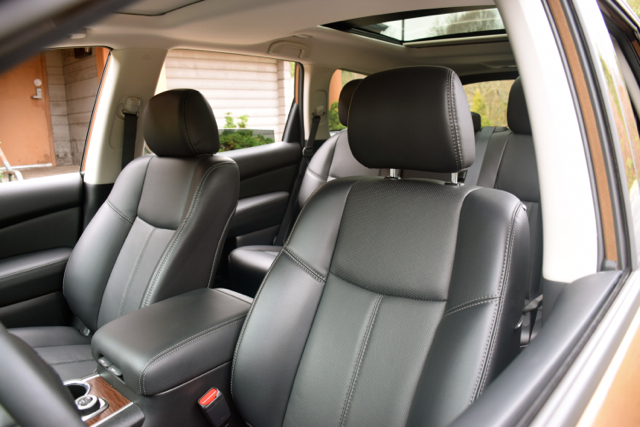 Overall, the Pathfinder is very quiet, rides smooth, and is comfortable. If you’re the driver, the sight lines are excellent and the seat is roomy and supportive. You’ll find all controls within easy reach, the dials clear and understandable, and the center stack clean and orderly. Some of my favorite Pathfinder attributes were the touchscreen with the easy-to-use navigation system, the deep storage compartment between the front seats, and the heated seats. Indeed, when the front seat heating elements are activated, you may be as impressed as I was by how fast warmth is circulated through them. Larger vehicles such as the Pathfinder rely chiefly on V6 engines to power these models. A few exceptions do exist — the GMC Acadia now offers a base four-cylinder engine, while the Dodge Durango makes available a V8. Fortunately, Nissan’s V6 provides a happy medium between fuel economy and performance, and does so without forced induction. Step on the gas pedal and the Pathfinder surely and steadily picks up speed. Gun it and the engine immediately responds. Previously, you would have sensed the engine was paired with a CVT as the RPMs build as your speed increases. It is an uncomfortable feeling for those not used to the sensation of an engine that gets louder before leveling off. With the new CVT, the transmission eases as you accelerate, supplying a more natural “shifting” sensation. Not having the benefit of a full passenger load or pulling a trailer means also not being able to experience the Pathfinder operating under the most extreme conditions. For some shoppers, moving up to the Nissan Armada is the next logical choice, as it supplies V8-performance along with 8,500 pounds of towing capacity. But you’ll also pay much more (from $44,900) and see your fuel economy drop by one-third. Clearly, there is much value in the Pathfinder, especially if your passenger or towing needs are more modest. If you choose the Pathfinder and regularly traverse rough terrain, then opt for available four-wheel drive. Unlike typical all-wheel drive systems, the Pathfinder 4×4 can be operated in full- or part-time mode — a dial allows you to switch to two-wheel drive only or choose four-wheel drive or automatic. To obtain the bulk of the available driver-assist safety features, you’ll need to look at the Pathfinder SL. Add in a tow hitch package ($400), tech package with navigation and blind spot warning with rear cross traffic alert ($1,150) and a cold package — heated steering wheel, heated front seats, and heated outside mirrors ($400). Add in 4×4 and your final price will come in around $42,000. Take advantage of incentives and your final price should come in no higher than $40,000. In all, the 2017 Pathfinder offers a complete package for families, supplying everything needed for local driving as well as for vacation travel. The improved powertrain, burlier visage, and agile handling make this model one worth considering. At the same time, you might also consider the five-passenger Nissan Murano if you prefer more standard storage room in a midsize SUV.